Musical “tee-lee-oo.” and, in flight, distinctive dry rattle mixed with “tew.” notes. Description: Black tail with white outer tail feathers. 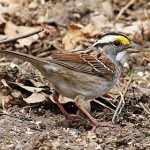 Breeding adult male has black head, throat, and breast; broad white or buffy stripe extending from behind eye down the neck and sides of breast; reddish-brown nape. 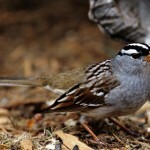 Brown, sparrow-like back and wings; white belly; and black streaking on sides. Breeding adult female and all winter plumages are duller overall and lack solid black head and breast; buffy ear patch outlined in black. Habitat: Migrants and wintering birds are found in open grassy plains, stubble fields, overgrazed pastures, and other similar grassy habitats. 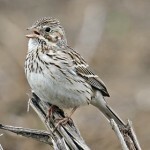 Where in Nebraska: Locally common spring and fall migrant and winter visitor across the state. Probably the most common longspur found in Nebraska during the winter. Often found amid flocks of Horned Larks and Snow Buntings. 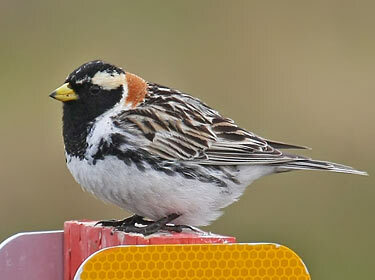 Fun Facts: Lapland Longspurs are known for forming and traveling in huge winter flocks, estimated at four million birds.